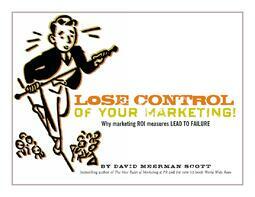 LOSE CONTROL OF YOUR MARKETING! What do you have to lose (but control)? Creating a 'World Wide Rave', in which other people help to tell your story for you, is a way to drive action. One person sends it to another, then that person sends it to yet another, and on and on. Each link in the chain exposes your story to someone new, someone you never had to contact yourself! You can create the triggers that get millions of people to tell your stories and spread your ideas. How to think in terms of spreading ideas, not generating leads. Why you should forget ROI and focus on what matters. 6 new rules for measuring an online initiative’s result.